Indomitable | The online home of Chauncey DeVega: The Power of The Tea Party Imaginary: Why is This Man Crying While He Sings the Star Spangled Banner? The Power of The Tea Party Imaginary: Why is This Man Crying While He Sings the Star Spangled Banner? When you figure out why this man is brought to tears by the Star Spangled Banner, you will finally understand the appeal of the Tea Party GOP. Moreover, when you figure out why this man is crying you will begin to grasp the difficulties faced by appeals to reason and empirically driven reality in trying to beat back the emotion, faith, and fear based nationalism of the Republican Party. 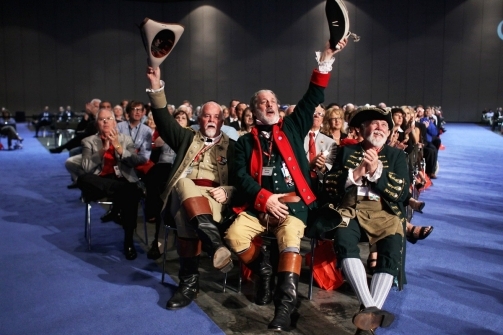 While it is easy to mock, scorn, and point out the odd mix of Constitutional Fetishism and love of dressing in Colonial era clothing that is common among the Tea Party brigands, the faux populist imaginary of the New Right is actually quite compelling, and thus, it demands a bit of critical attention. We know a few things about the Tea Party GOP. They are an astoturf organization driven by corporate money working in the interest of austerity policies and the shock doctrine. The Tea Party is made up of Republicans on steroids, and their members' policy positions are simply more extreme versions of Conservatism writ large. Racial resentment and fear of non-whites, immigrants, and any Other drives the Tea Party GOP's political imagination. In sum, while allowing for these facts there remain two points that have gone relatively uncommented upon. First, the Tea Party is easily lampooned; however, their songs, folksy misspelled posters, embrace of ignorance as authenticity, and love of costumes are a type of political theater. Consequently--and this is a point that many in the pundit classes and other professional bloviators seem to miss--"the show is the thing." Or as good ol' Jim Ross from the World Wrestling Federation is fond of saying, sometimes "you got to sell the sizzle and not the steak." Consequently, reasoned discussions of policy and good governance are made secondary to a sense of belonging. For folks who feel alienated, scared, and "want to take their America back" (from "the blacks, the gays, the atheists, the Socialists, the liberals" etc.) a sense of belonging is a powerful salve for alienation and anomie. A key point. When the ghouls in the audience at the last three Republican debates howled for murder, death, and in support of hatred towards Americans who happen not to be straight, they were marking out the boundaries of their political community. Their cheers were not those of outliers; they were the id of a community that stood silent in complicity and agreement. Second, and as I argued elsewhere, the Tea Party with its hostile faux populism is a cult-like organization whose ethos has infected the Republican Party as a whole. Emotion trumps reason. Faith has been mated with ideology to create a worldview that is immune from critical interrogation and intervention. Heretics are burned at the proverbial stake of Right-wing talk radio and Fox News. And ideological orthodoxy is the prime directive, even if it means destroying the U.S. economy (as was seen during the debt ceiling hostage taking by the Tea Party GOP), or believing in fictions such as cutting the federal budget in a time of the Great Recession will magically create economic growth. The connective tissue of these two observations is as follows. The Tea Party GOP effectively marshals emotion, nostalgia, faith, anti-intellectualism, and sentimentality. They in turn mate these elements with themes of "American exceptionalism," nationalism and "patriotism." This brew is reinforced and sustained by the Right-wing echo chamber and its modus operandi of epistemic closure. This is a potent mix for reactionary conservatives because the political opponents of the Tea Party and the New Right are effectively swinging at air. How do you land a body blow on ether? To political fictions driven by emotions that are only reinforced by their opposition's appeal to empirical reality? In all, how do you fight an idea...however wrong headed and ill advised it may be? President Obama's rediscovery of populism will do nothing to reach the extreme ideologues on the Right. That is a given. However, the chaff and distractions that the Tea Party GOP and their puppet masters have created, ones of false equivalence and a magically infused faith based politics that extends beyond the walls of the church and into public policy as a whole, is damnably challenging because of how it mucks up and befouls the public discourse. How do we reach the low information swing voters who are not equipped to navigate this morass? In the Age of Obama do liberals, progressives, pragmatists, and reasonable conservatives even have the capacity and will to spin effective narratives with which to counter the fictitious, faith based, emotion infused appeals of the Tea Party GOP? I do wonder...and worry that they may not. "A key point. When the ghouls in the audience at the last three Republican debates howled for murder, death, and in support of hatred towards Americans who happen not to be straight, they were marking out the boundaries of their political community. Their cheers were not those of outliers; they were the id of a community that stood silent in complicity and agreement." That went straight to facebook. Concisely and well said. Kwestin - is that because you're unreachable when it comes down to ontological matters, or, is that because even as a pseudo-anonymous Interweb interlocutor - you're not permitted to interrogate reality that deeply? How long after the naked exchange of threats at Cobb's between Guh-rard and myself, did it take for Breitbart to begin publicly making threats? Mebbe it's time to stop playing at the pursuit of public intellectual/entertainer ambition, and instead get serious about what's around that signpost up ahead? Cause best believe that when they pierce the flimsy veil of your online anonymity, it's gone be own like donkey kong. @Ish. Be careful Ish. you are going to make me think I am an effective communicator. @Cnu. You are right. I already have one monitoring me in class as we speak. Straight Fox Breitbart talking points and then when he is refuted he jots vigorous notes. The "they" already know who I am but I am small business and not worthy of the ammo yet. They probe around and make forays but I mostly deflect. What is up with Cobbers? I missed that episode. How are his white nativists doing? Also, what is your take on how the protofascists use dummy accounts and rss feeders to troll message boards. The technical side sounds really fascinating. Can you clarify it for lay knuckleheads like me? CD-beautiful work on this, it did my heart good to read it. I feel that there is an argument to be made against the Tea Party from a Faith based moral perspective. Something akin to the old southern religious democrat of the Rev. Dr. Martin Luther King Jr.'s time. Shifts in politics over the last few decades have resulted in a situation where the bulk of the southern/rural religious voter block has been poached from the Democratic party by the Dominionist Theocrats that now make up the heart (or at least a few chambers thereof) of the current Tea Bagger GOP. The arguments are there to be made from a faith perpective, but the Democratic party has pushed so hard to distance themselves from the religious base, and the Tea Baggers have welcomed them in with open arms. How in this modern era do we navigate championing issues such as women's rights (abortion), equal rights (gay marriage), undocumented worker rights (illegal immigration), Teaching science in school (taking gawd out of school)etc etc while still drawing in rural/southern religious 'moral' voters? Have we created this monster ourselves? @Cnu. We be dumb. Talk us through so we can do the same. @Weird beard. We have to go back. Study up on how the Right cooptated language and what we can do to fight back. I have a thought on what to do for a week as an experiment and protest; I do not know if anyone has the courage to do so. @Par. I agree with you. Send some links or cites so we can get them out there. In some surprising ways this doesn't differ much from the kneejerks of the late '60s and early 70s seeming to the casual observer to be centered around the Vietnam War, but actually a lot more broad based. Nixon's Great Silent Majority, on the one side, and militants for all manner of change, on the other. As an active part of the latter, I can attest that theater and emotionalism can't be countered with reason. Counter-emotionalism and counter-theater are the only approach with any hope of even partial success. And anyone who believes the activities of that time on the side of change weren't carefully planned theater is ignoring the unwritten history of it all. The Nixon anti-tax rebellion and Southern Strategy is all over this. We can't forget the tea party shtick was also operate in Boston during the anti-busing riots in the 1970s and early 1980s. Same trashy class of white reactionaries, even wearing tea bags on their hats.